Aspiring candidates should have done Graduation in any discipline from any recognised University. However those who are in the final year and expect to complete all the requirements of graduation. NIRD Entrance Exam consists of questions from the following Subjects/Topics. NIRD Entrance Exam consist of objective multiple choice type of questions to be completed in 2-1/2 Hrs time. The number of questions may range between 90 and 120. Candidates selected on the basis of the Entrance Test will be invited for Group Discussion and Personal Interview in some major cities or at NIRD, Hyderabad. How to applying for NIRD Entrance Exam?Aspiring candidate can fill the application form Online from the official website www.nird.org.in/pgdrdm. However the applications sent by post will also be accepted through downloadable form available on the website. The filled in Online (Hard copy) /downloaded application form should be submitted along with the Application Fee of Rs.200 (Rs.100/- for SC/ST and PWD candidates) through an Account Payee Demand Draft drawn in favour of NIRD- PGDRDM, payable at Hyderabad. The filled in application form should be sent to The Coordinator (Admissions), Centre for Post Graduate Studies, National Institute of Rural Development and Panchayati Raj, Rajendranagar, Hyderabad-500030, India, so as to reach on or before last date. 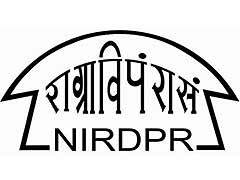 NIRD Entrance Exam 2018 – National Institute of Rural Development Entrance Exam acronym as NIRD Entrance Exam is conducted by the NIRD for providing admission to Post Graduate Diploma in Rural Development Management (PGDRDM) course. NIRD Entrance Exam is usually held in the month of November every year. Note: The Test Centres are subject to change depending on the availability of a minimum number of candidates.